Human rights and religious freedom within the European Union was the focus of a debate organised by the Conference of European Churches. The event was held on 5 December at the Chapel of Europe in Brussels, celebrating the 70th anniversary of the Universal Declaration of Human Rights. CEC Member Churches from EU member states shared their struggles related to violations of freedom of religion or belief, from both majority and minority church perspectives. It was stressed that violation of human rights and religious freedom is a hindrance in the mission of the churches. It is the first time CEC brought the issue of freedom of religion or belief within the European Union into the public debate in Brussels. “I cannot but express my concern about the deviation from, and even the forsaking of, human rights in our European countries, on the Balkan Peninsula, in some of the former Eastern Bloc countries, and in various parts of the world engulfed in war,” Metropolitan Porfirije added. Another example from a minority church perspective was highlighted by Rev. Marta López Ballalta, Vice -President of the Spanish Evangelical Church. She shared their struggle related to the case of pastor Manzanas Martín and the discrimination faced by him and many other ministers. She explained how there was a difference in treatment for other priests and Evangelical clergy in public pensions scheme. “In such a situation it seems fundamental for a Church to work for justice,” she added. 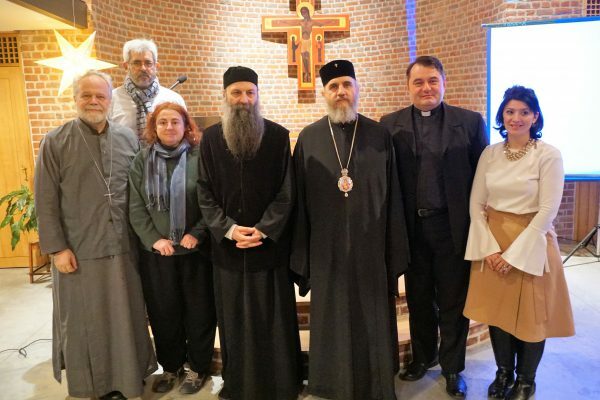 “Church of Cyprus is working closely with the other religious leaders of the island to bring an end to what is an unacceptable situation in an EU member state and to gain the total restoration of religious freedom for all the legal residents of Cyprus,” said Bishop Porfyrios. During the debate it was emphasised that Europe finds itself in times of rising populism and intolerant nationalism. On 4 May 2018, three major parties in the Bulgarian Parliament introduced changes to the Law on Religion, which if adopted will limit religious freedom for religious stakeholders. CEC will continue to assist Member Churches coming from inside and outside of the European Union, facing violation of human rights that limits their mission in European society. As a results of the 70th Anniversary of UDHR churches in various forums expressed their commitment to the promotion and protection of human rights with various stakeholders as distinctive part of the civil society. Facilitated by CEC, these speakers also participated in a seminar in the framework of Article 17 of the Treaty on the Functioning of the European Union on 4 December at the European Parliament. The seminar addressed the theme “Religion and Human Rights within the EU – A Shared Responsibility” hosted by Mairead McGuinness, First Vice-President of the European Parliament.